ARC & Books Giveaway -- Chat tonight! 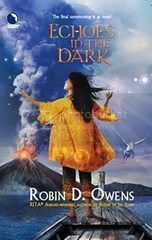 SFR author Robin D Owens joins us to discuss her book, Heart Change. Door prize: two lucky winners will each receive a signed copy of Heart Change! And one lucky winner will be the first to read a signed ARC of Heart Journey! Moderated by KatBos. I'll also be giving away a complete set of the Summoning series! Hope to see you, and may you enjoy your penultimate day of the first decade of the twenty-first century! The shuffled music on my computer this morning has been perfect. Sometimes I get a perfect cup of tea, too, with the right amount of tea and steeping time and sugar (ok, I know I could be more scientific about that...the current cup is a bit too sweet). Occasionally I find just the right words. But I don't aim for perfection in my writing, it is, as everything in my life is "the best I can do with the resources I have." If I wanted to craft my books to be the absolute best, I would take about three years to write a book. Not joking. But I have deadlines and readers waiting, and a need to eat. If you wait for your muse or hang onto the thought that something must be perfect, odds are that you won't get it done. Sometimes the muse and the starry night and the cats' purring will combine with the perfect music and cup of tea and you'll get lucky and manage to put down words that closely match the scene in your head. Don't count on it, but thank the blessing. I was vaguely thinking of book 2 in the Mystic Circle series for Luna a couple of weeks ago...this series had been in my head but not necessarily for Luna and I planned on starting with the hero's point of view. But Luna books are about a woman's adventure and growth so they like you to start with a female point of view...and I had that, but I didn't write it down just THEN and it slipped away. I firmly believe that all ideas will eventually return to you sometime or another...hmmm an interdimensional purse of lost ideas? DIBS!...but when they shake back out and onto your head like fairy dust glitter and in what form is always questionable...like three years from now when the book is done and out, would not be good. Jot your notes down now...and this applies to all creative endeavors. May you enjoy your bliss today. I believe the "my life is terrible" line was a hook, to get us interested in the hero. But it didn't pay off well, he had a good job and friends and power in the community. This guy wasn't a dark and brooding wounded man (which is usually used to show how much more dangerous he can be, fighting himself and issues, etc.). So not only is the pay-off lacking, but it also made him look weak. The fix, cut the first line. I did go on to finish the story and enjoyed it, but the set-up bothered me enough to write this. My mentor (who writes mystery-action-adventure) always like to show the hero in ACTION in her first scene. It's advice I hadn't heard before this last year (always learning new things), and something I need to try a few times, too. May you enjoy all your paperback heroes today. I am currently under contract for five books. I sold three of these books to Luna and got the advance this year. I sold the three "Heart" books last year. The last "Heart" book in the three book contract is due December 1 of next year. The proposal for it is due earlier next year. IF I turn that book in on December 1, 2010, my editor has 60 days to accept it...and that's pretty much when the option book(s) for the next contract need to be presented, which means if I sell more Heart books it will be in 2011. I will probably sell no more books next year UNLESS I find the Luna book is shorter, around 95,000 words and I can squeeze out another series somehow. You know, this looks like a whole lot of work, more than I'd vaguely realized in the back of my brain. Laev, **new hero**, Antenn, Vinni. Yep, a lot of work, good thing I'm a writer. May you enjoy looking at your future today. Every book should (WILL) have themes, probably both societal and individual. Gangs of boys can turn feral. A class system with great discrepancy can lead to violence. A class system can encourage a sense of entitlement. Power corrupts. Bad things happen to everyone, learn to deal with that which happens to you, grow. Everyone needs help, don't be afraid to ask. Know thyself. Those are some of the themes I've explored, but, hopefully, I haven't preached about them. Preaching, for me, includes rants on something, whether it is the value of romance novels or the complete failure of the U.S. judicial system or just a heavy-hand on the "considering women secondary to men is bad." I've read all of those. Even when I agreed with the ideas, I've felt uncomfortable, and I've been pitched out of the story. For me, of course, that is the one and only rule: Don't pitch someone out of your story. I've actually stopped reading some authors because I don't want to see the rant one more time. Of COURSE you have the right to write passionately of your beliefs, but recognize that your audience may not go along with you, and they have the right not to finish the book. Also, your readers may ascribe to you the beliefs that a CHARACTER has, true or false. I have strong political beliefs. I don't voice them in my books or here. I want to keep every single one of my readers...I want MORE readers. I already know that the society of Celta, with its belief in a male and female deity (and my characters decide whether they pray to the Lady and Lord or the Lord and Lady -- and in what instances) can be uncomfortable for people. If I make you feel and think, that's good, but I consider myself an entertainer -- taking you away to another place for a few hours so you can forget your [plumbing/car] problems. So, for me, educating you about romance novels or violence or slavery is not the main thrust of my work. I would say that writers who do this limit their audience, and for me that isn't something I want to do. May you enjoy your entertainment today. In the Northern Hemisphere, it's the shortest day and the longest night, but it always means for me that the days will be getting better, that hope of more light is on the way. Having to come and go from a day job in the dark will gradually change. Hope. I haven't been in the Southern Hemisphere, but for me, the Summer Solstice is a celebration of Summer. In any event, cherish the gifts that this day, like all days, bring. The titles of my Luna series and the first book has been changed. Since the books will be linked by a cul-de-sac, the address was considered and it will be Mystic Circle. The first book will be titled Enchanted No More. This may still change, if/when I'm notified, I'll put it up. May you enjoy all the byways of your mind today. For me there is a difference. With writing, I sit down and let the words flow or force them out, but I try to get into a rhythm. I may have no idea or only a general idea of what I want to accomplish. Crafting, for me, is a whole different matter. The scene I wrote yesterday was already in my head, had been mulled over for a while (due to the cat situation I didn't write it when it was fresh and first came upon me). Well, I also had to think about the scene because it changes the book drastically and that means big rewrites, one thread removed or minimized and another added...Did I say I was going to write shorter on this one? With crafting, I sit down and think of each word, each sentence and how to make it into a scene. How to describe what I want, how to invoke the emotions I want. I do not put my ** where a word needs to be changed and go on. I do not anticipate any revisions to the scene (of course there will be some). This is a very deliberate and THOUGHT-FULL process, not the general gift of a flow of writing or my usual process. Usually I consider crafting during revision. I am hopeful that I did well. May you enjoy your process and your craft any way it happens today. When I first started writing seriously I had a story that I wanted to write that I knew was beyond my skill and technique...since then that story (a contemporary romance) has faded. Then there was Heart Thief, book 2 of the Heart series. It features the sentient starship, Nuada's Sword and I started each of the chapters with a bit from the "Captain's Log" of the last days of the multi-generational voyage before they found Celta. Since Heart Thief was first a romance, then a fantasy, then a romance again, I had to change the bits around and gave up. I still have them all and someday I might be able to publish a novella called Heart and Sword. Meanwhile, I used the story in Heart Journey which will be out next year. But I found the Captain's Log, a story within a story at the start of each chapter beyond my technique, especially since I was trying to echo themes. Now I'm hesitant about a scene because I think it, too, is beyond my technique...and I know that whatever I do, the words on the page won't match the scene in my head. May you do the best you can today with the resources you have. Several ideas for the blog have come and gone without me wanting to write of them, but this one stuck. Mostly because I've taken to listening to an audio book as I fall asleep. I'll talk of audio books some other time. In my critique group, we read the work aloud. This is an excellent technique for seeing awkward wording or sentences or if something sounds stupid or if you didn't get something on the page that was in your head. There is a drawback, I think you can get away with more alliteration when not reading aloud, and some language tricks, that you can't when you DO read aloud. Be aware of these. Reading aloud should also catch repetition of words and thoughts/ideas. I have some friends who read their whole book aloud before they submit it. So think of using this technique, even by yourself...and if you do, you'll also know which parts would be good for reading at signings. Also, both in critique group and at signings I've known people who don't do their work credit, as well as making the work sound better. May you enjoy everything you read today -- aloud or not. Layering is a technique that many writers use. They sketch out dialogue, or description, or action briefly, then go back to the scene and "layer" in other aspects. Motivation and visual reactions and cues, choreography, etc. I do this occasionally when my brain is going faster than my fingers and I have about three different things I want to do in the scene -- and new ideas coming up. Skip a half page or page down, write a few lines, go back and flesh out the between bits. Like everything else, this is a technique that may or may not work for you, but something I put out there if you want to try. For the reader, the scene should be seamless, and the scene may have more depth. May you forget yourself in a book today. 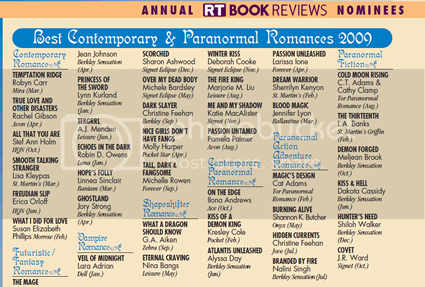 Romantic Times Book Reviewers Nominee! I am very surprised and pleased to announce that Echoes In the Dark has been chosen to be a Romantic Times Book Reviews Best Book nominee. I've been here before, but not for some years. I'm also honored to be in such good company. Thanks for all the support of everyone and may today be a joyful day. I recently read (gobbled down) two historical action-adventure books in a series and woke up this morning knowing that I wouldn't continue with the series right now. Naturally, the first thought was of the author and how I'd feel if I knew someone had decided to do that with me (and I know there are people out there, the series didn't grab them). Then, me being me, a person who defines herself first as a writer, I analyzed why I didn't want to go on. I decided that the character arc of the main character was lacking in the kind of growth I like to read about and the action-adventure wasn't rivetting enough to keep me reading...and I admit that I read the teaser of the back of the book for the next and decided that in the set-up the hero was making a big mistake, so that made me feel impatient and less sympathetic to him. I am a firm believer in the archetypal story arc that Joseph Campbell set out in his Hero of a Thousand Faces and Christopher Vogler refined for writers in The Writer's Journey. If a book misses several of these "beats" or steps, then I am dissatisfied. That's what this series did for me. I think I may go back to it, eventually, but not right now. I feel no urge to gobble. I also believe that it is always good to stretch your reading habits and these books did do that for me, so that was important too, and I thank the author for that. May you keep an open mind. The December website is up! Free Your Artist is about Stars...again with monthly ecard and divination site links. I hope you explore and enjoy! May you enjoy all explorations today! I have a seminar that I call "Write To Survive, Survive to Write, Practical tips to hanging in there before you're published." Some of these tips will be taken from that seminar. Check your lighting in your creative space, is it right for you? For a long time I wrote in the evenings and nights, but now even the thought of looking at a bright screen in the dark makes my eyes ache. I have an overhead light in my office, a full-spectrum desk lamp, and in the winter the sun comes in most of the day. I very rarely write with the overhead light on, that's to look at the bookshelves or EDIT or read research material. Changing the light in your space can signal your subconscious that it's time to be creative. Turn a special light on. Light a candle. May you enjoy all the light around you today. First I want to say that since this blog is now linked to Facebook and amazon I may be repeating things that I've said before (not that I don't anyway, and hopefully sometimes with a new slant). I think I'll also stick more with On Writing and Publishing (and READING) than with personal stuff -- though I consider myself a writer, my primary being, and talking about my writing and plot etc. will be natural. Weather, car problems, and even the cats will probably not appear as often. So, Choreography. I've recently read a couple of books where the choreography wasn't kept straight, something later in the book disconnected with something earlier. As a reader this bothers me, but as a writer I just sigh and shake my head. Things change in the drafts, in requests from the editor, in copy edits and final page proofs. If the same people have been reading the ms. the whole time, they might not catch it. No author wants disconnects, wants set ups that go awry or aren't paid off, want little changes in storyline that doesn't follow through. More, if they see it, they wince, at least I do, and I was recently emailed about an error that happened over a few books. Again, be aware that you are reading something in a few hours/days that it took an author months or years to craft. Just the thought of that can usually have me cutting an author a break on choreography. So, yes, I am disappointed in books where something is screwed up and horrified if a flaw that I thought I fixed didn't get done, or if I forgot something despite my notes. But the wonderful thing about books and stories is that they tell of the human condition and we are all very human. May you enjoy all your connections today. As a reader there are some authors I will always trust and always read. As far as I'm concerned, this is a treasure, even if the back cover copy shows that the plot/storyline is not one I would normally read. As an author, I can only aspire to being that for my readers. So, reflect on the authors you enjoy, and authors, think of your compact with your readers. This doesn't mean you don't grow and stretch, but know when and how to take chances. Reminding you all that determination plays a big part in being a writer, and in any other artistic endeavor. You have to keep going. Since National Novel Writing Month is over, I want to congratulate those who participated and celebrate their efforts. To all struggling writers, Never Quit. Enjoy all your own, unique creativity today, whatever it is. I've had to change my titles often, most notably Singer for a World became Echoes in the Dark. This is mostly due to the marketing departments of my publishers or my editors' consideration of marketing. In any event, the book I've been working on, Out of Balance, will no longer be called that, since it doesn't strongly imply a genre. The alternate title for that story, A Dwarf At The Door, is too fantasy. So we are running through titles and any feedback will be heartily welcomed. "Lightfolk" will not be the series title. Since the urban-fantasy-paranormal books will be linked by houses in an magical cul-de-sac or enclave, I (and critique buddies) am working from that. Enchantment Way, Enchantment Enclave, 4 Mystic Way, 124 Mystical Place, whatever. I think I'll be getting/sending ideas today. I've gotten used to changing titles, it's usually a battle not worth fighting because you can't win. Changing a character's name is much harder. Brandy, in Sorceress of Faith, became Marian, and it took me most of the book before I thought of her as Marian. So, advice, don't fall in love with your title...and when I have a new one, I may go back and insert it in all the blogs where I put Out of Balance. May you enjoy whatever title you have, or are reading, today. On the personal front, I won NaNoWriMo with great effort in the last couple of weeks, I don't recommend that. Also the new cat seems to be settling in, but cried all last night from 3 am on since, huge cat fight night before last at 3:30 am. It's preferred spot is in the crawlspace where I can't reach it under the corner of the front porch. Since it's snowy today, and the dirt crawlspace is nasty, I am concerned, but I can't pick it up. I've been trying to lead him to the warmer laundry room-back porch-pantry, but that hasn't worked yet. This has been a lot more stressful on me than I'd anticipated. Dingo doesn't like him and he's as big as Dingo.